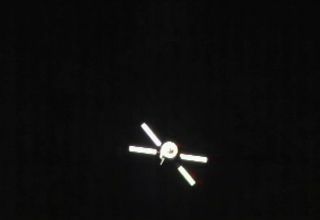 The European Space Agency's ATV-3 Edoardo Amaldi supply ship is seen undocking from the International Space Station on Sept. 28, 2012, in this still image from a video camera on the station. An unmanned European cargo ship the size of a double-decker bus undocked from the International Space Station Friday (Sept. 28), ending a six-month delivery flight to the orbiting lab. The robotic Automated Transfer Vehicle 3 (ATV-3), with its four X-wing-like solar arrays unfurled, cast off from the space station Friday as the two spacecraft sailed 255 miles (410 kilometers) over western Kazakhstan in Asia. The cargo ship's undocking occurred at 5:44 p.m. EDT (2144 GMT). The space departure occurred three days later than planned due to delays, first by a computer glitch and later by space junk near the space station. "Today, everything has worked to perfection," NASA spokesman Rob Navias said during the agency's live broadcast of the undocking. The ATV-3 spacecraft was built by the European Space Agency and delivered 7.2 tons of food, water and other vital supplies to astronauts aboard the International Space Station when it launched in March from a South American spaceport in Kourou, French Guiana. The ATV-3 spent 184 linked to the space station before being packed with trash and other unneeded items for its eventual fiery demise in Earth's atmosphere. The ATV craft are huge cylinders 32 feet long (10 meters) and nearly 15 feet wide (4.5 m) and may be visible by observers on Earth as a bright moving light in the night sky, weather permitting. The ATV-3, like the International Space Station, can be spotted if you know where to look. The European Space Agency is also holding a photo contest for satellite trackers hoping to snap a photo of the ATV-3 as it orbits the Earth during the next few days. Prizes will be awarded for the best snapshots. "We look forward to seeing any and all photos of ATV in free flight and we wish you happy snapping for the contest!" ESA officials said in blog post. The next ATV to launch toward the space station will be the ATV-4 Albert Einstein, which is slated to blast off in April 2013.